With 80% of internet users owning a smartphone, mobile marketing is leading the way people interact with brands. Global companies such as Southwest Airlines, McDonald’s, Apple and Ford are leveraging mobile survey campaigns into their digital marketing strategy with great success. Delivering surveys on mobile devices – right at the point of their audience’s experience or interaction – not only resulted in an increase in brand loyalty, but also a heightened customer experience providing them with the data they need to continuously improve upon their products. Do not underestimate the power of surveys on the go. Consumers want to share their opinion and input, especially when it is in their direct interest or when it involves a brand that they are loyal to. Even Facebook and Instagram have added a poll feature. It is an opportunity for your audience to engage – allowing for instant feedback. Mobile survey campaigns are one of the best ways to gauge sentiment and to gain deep insight into your target market. Firstly, what would you like to achieve? What questions would you like to have answered? Create a campaign based on the desired end result. Offering sufficient response choices and ensuring that the questions being asked are unambiguous will guarantee more reliable results. Thanks to products like Wi-Fire getting to know your target audience is a walk in the park. With their full Audience Analytics Suite you can get an even deeper understanding of their interests and consumer habits. 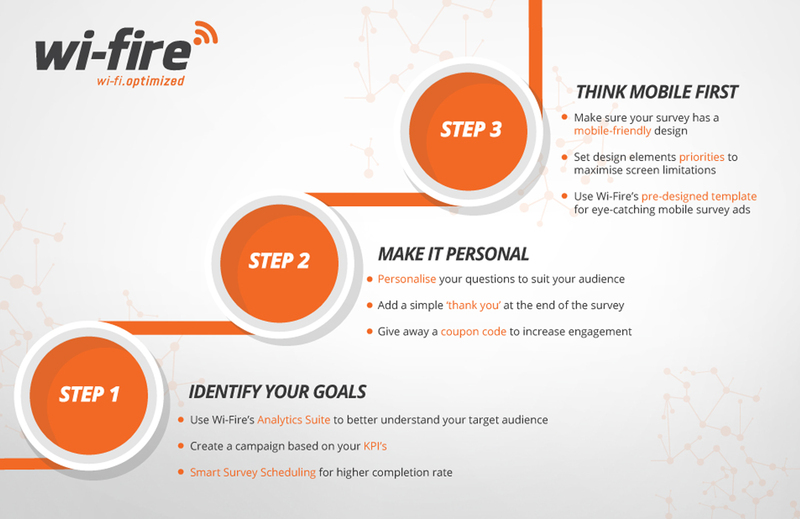 When setting up the survey, keep in mind that the target audience is likely connected to the free Wi-Fi hotspot to browse or engage on social media. Depending on where about your audience is located, you will need to judge when the time is right to to send out the survey in order to get a higher completion rate. The more personal, the more accurate the responses. The better you understand your target audience, the more you can tailor your questions to suit them, and the more likely they will be to provide accurate answers. Add a simple ‘thank you’ at the end of the survey to show your appreciation for their time. Engage your target audiences by providing them with an incentive. For example, give away a coupon code for an in-store special after completing the survey. This will ensure a higher completion rate. Making sure that your survey has a mobile-friendly design is crucial. Mobile phones offer just 5% of what would be available on a desktop PC in terms of screen space. Therefore, it is recommended to avoid designs where the user would have to scroll or pinch the screen to view more. Products such as Wi-Fire offer a pre-designed template for your convenience, ensuring a seamless experience for the user and making it more likely for them to complete a survey again in the future. In a nutshell, successful mobile surveys should be simple, easy to use, personalised and to the point. Having a strong mobile survey campaign will give you in-depth insight into improving long-term customer satisfaction and refining your products, and should be part of your marketing roadmap as you push through 2018. INTERESTED? REQUEST A FREE WI-FIRE DEMO TODAY!